Ever walked into a pub and been confused by the choice of beers on offer? If so, here’s a quick guide to the various types available in UK pubs. 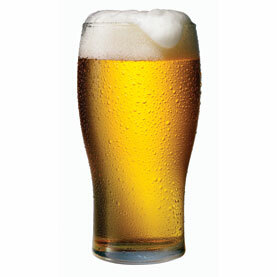 Firstly, beer is a catch-all term for ale and lager, and the difference is in how each is brewed. Basically, yeast used to make ale ferments at the top of the fermentation tank (top fermented), whereas lager yeast ferments at the base of the tank (bottom fermented). Also, beer ferments at a higher temperature than lager, and lager takes longer to ready as it requires a period of cold storage after fermentation. Pale Ale: Also called Bitter, this beer gets its colour and name from the pale malts used during brewing. Session or Ordinary Bitter has a strength of up to 4.1% abv, Best or Regular Bitter has a strength of between 4.2%-4.7% abv, and Special or Strong Bitter has a strength of 4.8% and above. Another popular type of Bitter is IPA (India Pale Ale). Porter: This beer is dark in colour as a result of being brewed using dark malts. Porter also tastes less hoppy in comparison to Pale Ale. Stout: This strong porter variant comes in several styles including Imperial Stout (IP) and Irish Stout, which includes the world famous Guinness. Mild Ale: Sometimes called ‘Dark’, Mild ales generally taste malty and mildly hoppy (hence the name), and are fairly low in strength (3-3.6% abv). Higher abv Milds are available, as are lighter coloured Milds. Brown Ale: This brown beer (hence the name) is still a popular bottled ale, with Manns Original and Newcastle Brown probably being the most famous examples. Old Ale: Modern Old Ales are typically malty tasting, dark in colour, and with an abv above 5%. Certain old ales continue to mature even after bottling, and can therefore be left unopened for years. Barley Wine: So named because this grain-based drink can be as strong as its grape-based cousin, with typical alcohol strengths in the 8% to 12% region. Wheat Bear: Witbier or Weissbier is a popular beverage in the Netherlands, Belgium and Germany. Wheat is added alongside barley during brewing, hence the name. This German invention comes in two main categories – pale lager and dark lager. Pale lagers are the golden beers served everywhere (varieties include Pilsner, Helles and Dortmunder), whereas Dark lagers are more common in mainland Europe. You can also find brown and amber coloured lagers, often in the Bock and Mrzen variety. Foreign lagers – such as Stella, Carling and Fosters – rule in the UK, and are either imported or licensed to be brewed domestically. Brains – well known in Wales for its ales – launched a lager in 2006 but it failed to catch on. However, domestic craft brewers are active in lager production, with BrewDog, St Austell’s and Cotswold Breweries all getting in on the act. Finally, don’t forget that beer isn’t just about choice, it’s also about flavour. For a truly great-tasting pint, licensees need to maintain clean beer lines. One tried and tested way of doing this is to fit a line cleaning system. CellarBright systems are found in bars, pubs, clubs, restaurants and hotels all over the UK, and they help ensure that cask ales, lagers and ciders keep tasting fresh. CellarBright is a unique automated beer line cleaning system which may save thousands of pounds a year for businesses selling keg and cask beer and lager. It reduces waste by letting the beer that’s in the lines be drawn off and sold before cleaning commences, allowing you to sell 100% of the beer that you’ve paid for. A beer profit calculator on the site shows how much you can save.